Tough loss for the team today, but plenty of positives to take from the performance. Onto a big one next week! Big thanks to @BBCRadioStoke for having me on today. Great experience working with @mattsandoz1 and Nigel Johnson. ???????? A shot of our latest commentator from yesterday... He did very well by all accounts, but let's hope that there's no change of career quite just yet! Sadly it wasn't to be yesterday, as the Potters conceded five at home for the first time since November 2000 (against Liverpool in the League Cup). Mark Hughes admitted defensive frailties cost his side, whilst we'd also like to remember the huge slice of luck the visitors had for their opener of the afternoon. Read the manager's post-match thoughts HERE. Deserve a point here......Get it in! After a good passage of play by the Potters, the ball is worked to Steven Nzonzi who sees his 16-yard effort blocked as it headed towards the far corner. Cissokho left wing cross finds its way to Sterling but his tame shot from 20 yards is easily gathered but Butland. Daniel Strurridge comes on for Philippe Coutinho on 67 minutes. The game is starting to become very stretched as the rain continues to pour down at the Brit. Liverpool are set to bring on England striker Daniel Sturridge with 65 minutes on the clock. The corner however comes to nothing. Good link up play between Crouch and Arnautovic wins City a corner in front of the Boothen End. Shawcross goes into the referee's notebook after bringing down Suarez just inside the Stoke half. Henderson fires well over from 20 yards after City fail to clear their lines. The rain is starting to come down here now. 27,160 is the attendance here at the Britannia Stadium. The highest home crowd of the season. Aly Cissokho brings down Charlie Adam on the edge-of-the-area and gets booked by the referee. Steven Gerrard takes the penalty and sends Jack Butland the wrong way and fires into the keeper's bottom right-hand corner. Liverpool have been awarded a penalty. Wilson has fouled Sterling inside the box. We're back underway here at the Britannia Stadium. He's a trooper is Jon! #scfc Substitutes vs Liverpool: Sorensen, Muniesa, Pennant, Palacios, Etherington, Shotton, Ireland. Come on Stoke! Nzonzi and Whelan get the game underway, come on Stoke!! 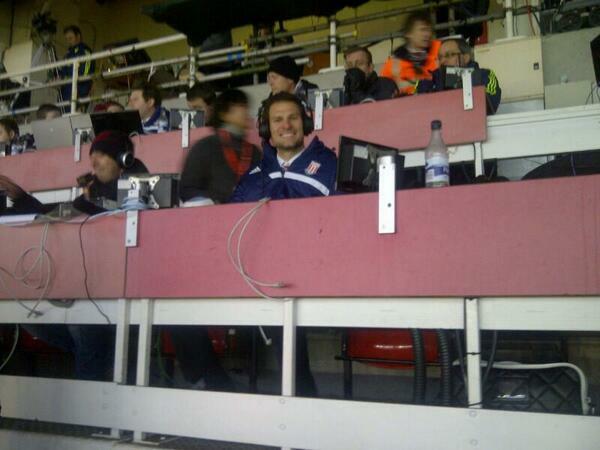 Asmir Begovic has joined us up in the commentary box today, and he's now on Stoke City Player alongside Matt Sandoz and Nigel Johnson. Get yourself logged on and listening! And out come the two teams onto the pitch, to a standing ovation. We're sure excited for this one!